For a unique finishing touch to any suit or tux, Barktobow Bowties offers one-of-a-kind, beautifully handcrafted bow ties with the option of matching wooden cuff links. 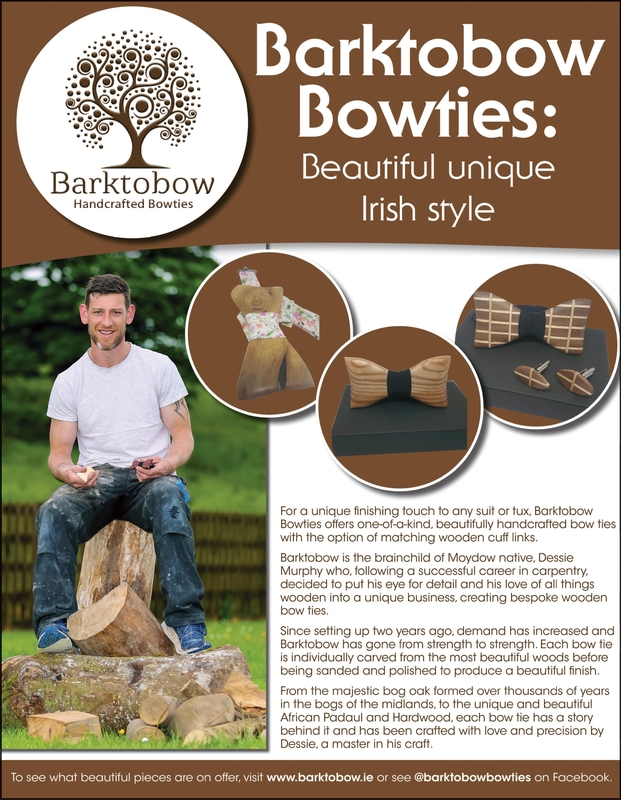 Barktobow is the brainchild of Moydow native, Dessie Murphy who, following a successful career in carpentry, decided to put his eye for detail and his love of all things wooden into a unique business, creating bespoke wooden bow ties. Since setting up two years ago, demand has increased and Barktobow has gone from strength to strength. Each bow tie is individually carved from the most beautiful woods before being sanded and polished to produce a beautiful finish. From the majestic bog oak formed over thousands of years in the bogs of the midlands, to the unique and beautiful African Padaul and Hardwood, each bow tie has a story behind it and has been crafted with love and precision by Dessie, a master in his craft. To see what beautiful pieces are on offer, visit www.barktobow.ie or see @barktobowbowties on Facebook.